If you're having trouble with the steps in this article, additional assistance is available via CloudTech, our premium services division. Our expert engineers can assist in administering your MySQL environment for optimal performance. For more information on what CloudTech can do for you, please click here. The following guide will show you how to access phpMyAdmin for your Grid and how to perform some basic operations on your databases. as the root MySQL user, "admin." This is necessary for performing higher-level database tasks, such as importing an SQL backup file or changing permissions on a database user. Log in with your database username and password. If you receive a login error, please try clearing your browser cache. You can also access phpMyAdmin from the AccountCenter. Select your primary domain name from the Domains tab. 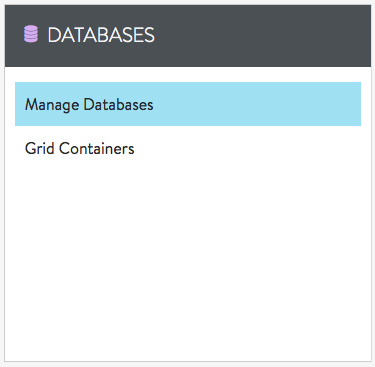 Select Manage Databases from the Databases menu. Click on the gear next to the database you wish to edit. phpMyAdmin will launch in a new window. Log into phpMyAdmin with your database username and password. We recommend to create a new Database User. This way, you will not interfere with existing applications. phpMyAdmin will often keep incorrect login information cached in your browser. If you get a login error, please try clearing your browser cache. See Errors logging into phpMyAdmin for details on this error. If you still receive an error, please reset your database password. Not sure how? Read: Changing the password for a Database User. You will now be able to administer your databases through phpMyAdmin. Your session will time out after 30 minutes of inactivity. Log into the Plesk Control Panel. Once you're logged in, click on Databases. Under Subscription, click on the domain associated with the DB you'd like to work with. 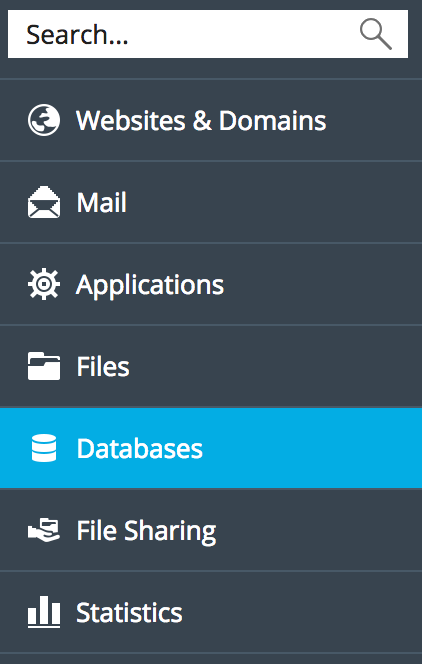 Scroll down to the database you'd like to work with and click on the phpMyAdmin icon below it. This will launch the phpMyAdmin utility in your browser. 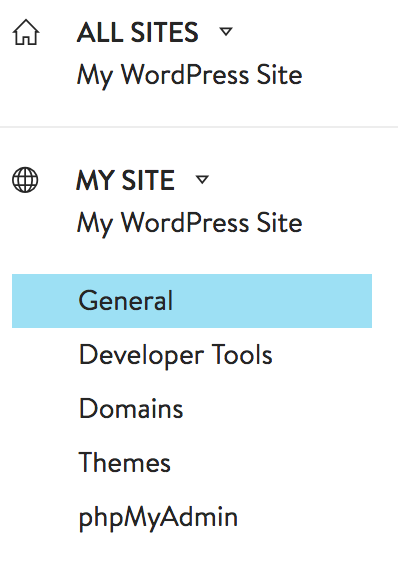 You can access phpMyAdmin directly from the SETTINGS panel of your WordPress Hosting site in the AccountCenter. Click on the site you would like to access the database for. Click on the phpMyAdmin link located in the menu to the left. phpMyAdmin will then launch and you will have access to your database. You will now be able to administer your databases through phpMyAdmin. Select the database you want to use from the list on the left. Select the tables you want to use. When optimizing or repairing, you should select Check All. The "Empty" and "Drop" actions will remove content from your database. Please do not do this unless you are sure you want to remove this content. Empty - This will empty all data from the selected tables. Drop - This will drop (delete) the selected tables. Check Table - This will check the tables for errors. Optimize Table - This will perform some basic table optimizations. Repair Table - This will attempt to repair your tables. Analyze Table - This will analyze your tables. Select any tables that are marked as "in use" in phpMyAdmin. 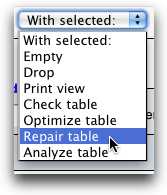 In the "With selected" dropdown menu, select the "Repair table" option. MySQL will now attempt to repair the crashed table. The repair operation may take a while to complete, depending on the size of the table.